Chloe Radcliffe is no stranger to making fresh starts in life. After being married for close to thirty years and then getting divorced she began a new life for herself in Cedar Key, Florida. She was ready to begin a new chapter in her life and relocate to Ormond Beach with her new partner Gabe until tragedy struck and he dies suddenly. Now that her aunt has died and her sister is contemplating relocating to France with her husband and daughter, Chloe must once again think about where to go and what to do in Patterns of Change by Terri DuLong. Chloe has had to make a lot of changes in her life over the past few years due to divorce and death. Now that the business she works for on a part-time basis is about to close, it might be the right time to begin again somewhere new, and that somewhere new is Ormond Beach, a few hours away from Cedar Key. Before Chloe sets off to explore Ormond Beach, she has a vivid dream about a beautiful house and a koi pond. Imagine her surprise when she arrives in Ormond Beach and finds the house of her dreams. The surprises keep coming when she meets the owner of the house, Mavis Anne Overby, and her niece, Yarrow Overby. Before she knows it, Chloe is set to go into business with Mavis Anne and is moving into her dream house. She's even met a man, not to mention developed a phone friendship with the owner of the condo she initially rented in Ormond Beach. Just when she thinks things are too good to be true, Chloe is forced to confront a secret from her past. Will she be able to overcome her feelings of anger and fear or will she continue to allow the past to dictate her future? "Gatherings of women have been occurring since the beginning of time. Whether it was a sewing circle popular in the eighteen hundreds, a knitting group during the war years of the forties, a coffee klatch in the fifties and sixties–women had been drawing together to socialize and bond. It was universal and it didn't matter where the location was. Women gravitated together to form connections." Chloe and her family and friends might only be characters on a page, but it is easy to feel, as a reader, that you've connected with them in some way. For those of you that knit, you'll probably enjoy the free knitting pattern that Ms. DuLong includes with the story. I'm not a knitter, but even I was tempted by the knitting and yarn discussions in this book. 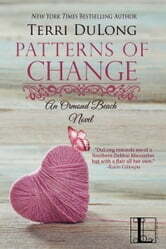 If you enjoy reading feel-good stories, then you'll want to read Patterns of Change. If you've read and enjoyed the Cedar Key series, then you'll definitely want to grab a copy of Patterns of Change and read it. Disclaimer: I received a digital copy of this book for review purposes from the publisher via NetGalley. I was not paid, required, or otherwise obligated to write a positive review. The opinions I have expressed are my own. I am disclosing this in accordance with the Federal Trade Commission's 16 CFR, Part 255: "Guides Concerning the Use of Endorsements and Testimonials in Advertising."